As LinkedIn turns 10 years old today, it’s interesting to look back at its storied history and take note of some events that have defined what the company is about and shaped where it is now. From the highs to the lows, LinkedIn has certainly been about helping connect people and getting them back to work. Here we take a look at ten of those events, whether they’re about the company specifically, the product, or anything else. Two years after the company was founded, LinkedIn unveiled its monetization strategy with the release of premium services. LinkedIn Jobs was the first of such revenue generators and was quickly followed up with subscription services and on-site advertising. Today, those same sources are generating considerable money for the company, with the bulk (57 percent or $184.3 million) coming from the Talent Solutions business unit for recruiters. On May 19, 2011, LinkedIn traded its first share on the New York Stock Exchange as a public company. It became one of the biggest IPOs with 7.84 million shares available starting at $45 per share. It quickly skyrocketed up 84 percent to $83. At the time of this writing, it’s selling for $176 per share. In a move to accelerate the company’s growth, LinkedIn established partnerships with several prominent companies and brands. In one of its first such relationships, the company signed a deal with The New York Times for content sharing. 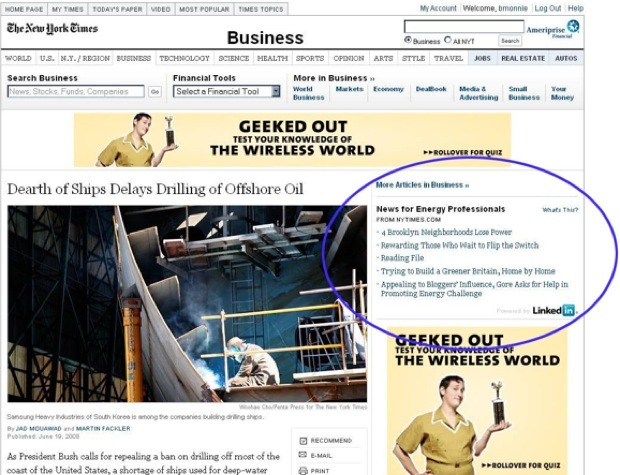 Through this initiative, LinkedIn users were able to view personalized news on the professional social network that is specific to their industry in the Business and Technology section of NYTimes.com. Other partnerships soon followed, including a deal with CNBC — also to bring in the financial network’s data and news into LinkedIn for its professional members to digest and share. CNBC was also supposed to bring LinkedIn’s community and network functionality into its site and even air content from the social network on its programming. From here, the relationships grew with IBM Lotus, BlackBerry, and Microsoft signing agreements with the company soon afterwards. In 2008, there was a leadership shake-up at LinkedIn with then-President Dan Nye resigning so that Hoffman could retake his seat leading the company. The move wasn’t a result of financial turmoil in the company, but rather because Hoffman wanted a leader who would “own” the product as well — something that Nye apparently wasn’t able to do. Earlier this year, Hoffman recounted the events in question in a blog post entitled “If, Why, and How Founders Should Hire a ‘Professional’ CEO“. He said that Nye was brought in because of his strong organizational background experience and fit in well with LinkedIn’s culture. Nye helped change LinkedIn from a product-focused startup to a “complete company”. The idea was that Nye would serve as CEO while Hoffman would be the COO and address the product question. Unfortunately it appears that Hoffman’s idea of the CEO changed and he felt that the company head should be responsible for both guiding the company and its product. And so the hunt went on for someone who had “consumer internet product experience and organizational experience at scale.” That person eventually wound up being Jeff Weiner, a former venture capitalist at Greylock Partners and interim President at LinkedIn when Hoffman reclaimed his CEO seat. 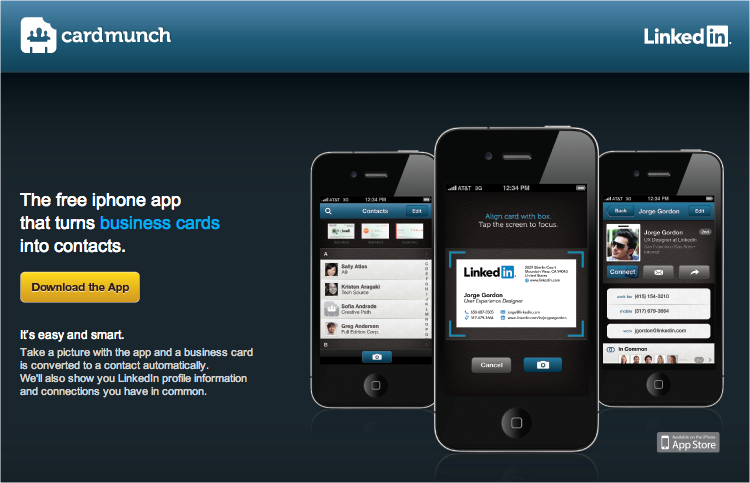 While not the first acquisition in the company’s history, the purchase of CardMunch and its business card converter system has helped move LinkedIn towards becoming a contact relationship platform. While deal specifics were not released, the move allowed LinkedIn users to take any business card and capture it using their smartphone and have it converted into phone contacts through the use of Amazon’s Mechanical Turk. With CardMunch joining the professional social network, it helped lay the groundwork for additional acquisitions like Connected to help users associate important pieces of information about someone to their LinkedIn profile. This would eventually go into the creation of LinkedIn Contacts. In 2011, as the US economy was in shambles and the rest of the country was in the midst of the Great Recession, President Barack Obama organized a town hall style meeting at the Computer History Museum in Silicon Valley. LinkedIn was chosen to host the President and the discussion. During this interactive session, the President spoke about the American Jobs Act, Social Security, and a host of other issues plaguing the American public. While perhaps simply a symbolic show, LinkedIn’s choice is poignant in that it highlights that Obama recognizes the opportunity that the social network can offer to help get Americans back to work. It took LinkedIn a year to reach 1 million registered users and seven years later, the company reached 100 million. This number still falls short of other social networks like Google+, Facebook, and Twitter, but having that many people focused on professional development instead of simply telling the world what they had for breakfast is nothing to shake a stick at. What makes this fascinating to note is that while it took eight years to reach this number, LinkedIn only needed two more to reach 200 million. It can’t all be good news for LinkedIn and this is probably one of the worst things to happen to the company in its decade-long history. This past June, the company shared that 6.5 million passwords were stolen. Even though they were all hashed, LinkedIn still recommended users reset their password. In October 2012, LinkedIn unveiled a new feature called its Influencer Program. The intent was to have thought-leaders in various categories pen their opinions on LinkedIn’s site. These would not be funny cat photos or anything that would normally be found on Facebook, but rather thoughts of a more professional nature. It started out with 150 influencers, including Gary Vaynerchuk, Caterina Fake, David Edelman, Charlene Li, Clara Shih, and others. The launch of this program meshes with the company’s acquisition of content services SlideShare and Pulse. With these three offerings, LinkedIn is looking to create and share more thought-provoking and original content in order to foster discussions within its network. These are just 10 of the notable events in LinkedIn’s history and in no way do we presume them to be the most important. However, they have had a direct impact in shaping the course of the company. In the next 10 years, what major events will help evolve LinkedIn, its products, and the team? We’ll have to wait and see.